A few years ago, I made a baby quilt for a friend of mine and had a few left over pieces. Left overs always make their way into my scrap bin. I hoard them until I come up with something interesting to make. When I feel like sewing but don't feel like delving into a huge commitment, I turn to my scrap hoard for inspiration. This mini quilt was a result of that; it was a quick assembly of my previous efforts and an experiment of a quilting technique that was new to me. 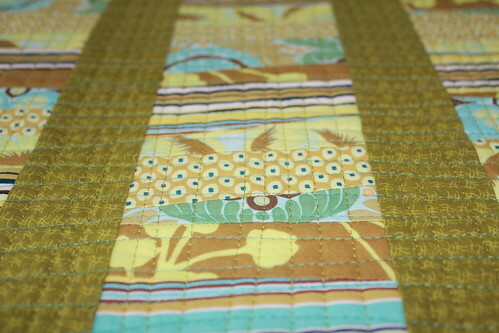 I am accustomed to free motion quilting and have never quilted in a straight line. This is about as close as I have ever gotten to that, not exactly straight but my feed dogs were up and my sewing went back and forth in one general direction. After having stitched all of the North to South lines, I felt the need to stitch East to West as well. I ran out of green thread but finished up with turquoise. 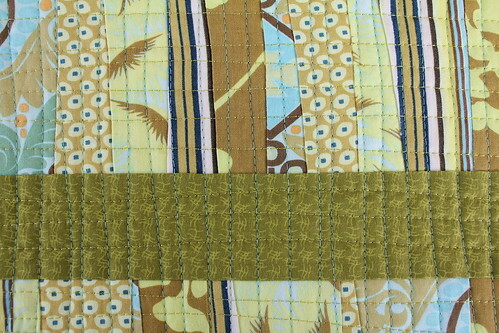 Necessity, being the mother of invention, resulted in this two toned relaxed grid work that I was quite pleased with. 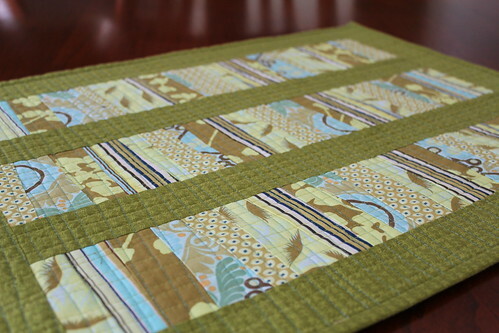 It is good for me to experiment with scraps. Some trials turn out better than others but I can tackle a scrap experiment without fear of ruining something of which I have put in a lot of effort. Wow! I love this little quilt. 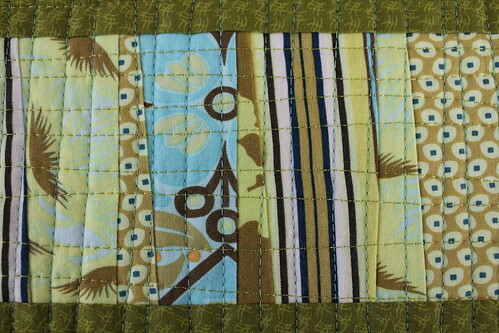 I love the colors and the wonky grid quilting. Gonna pin it to Pinterest.com! I like this and your blog! I love your mini quilt and the different colours in the quilting. Great.